At Vagabond tours of Ireland, we pride ourselves in going off the beaten path and exploring the unique hidden corners of Ireland, as well as some of Ireland’s best known sights. We show you parts of Ireland most Irish people don’t know exist. Our professional, knowledgeable and colourful guides will give you an insight into Ireland’s ancient past and the myths and legends that make our island so special. 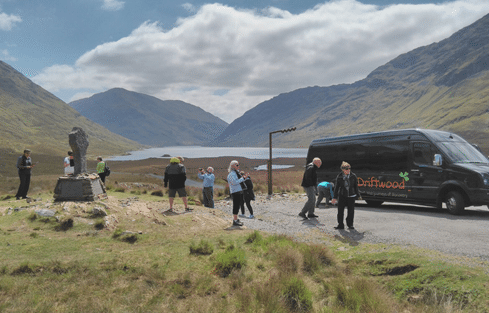 The Driftwood Journeys of Discovery will take off the tourist trail to some Ireland’s most unspoiled scenic and historic locations. A Driftwood tron off the road.